Signs of Spring are all around us and we have had a blast watching for baby animals around our neighborhood. 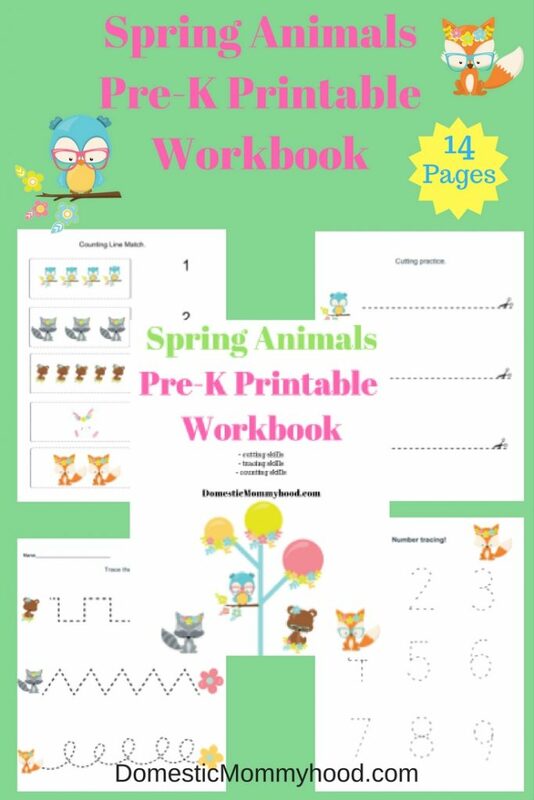 I figured it was time to come up with a Spring Animals Pre-K Printable Workbook that is perfect for any Spring Pre-K Theme! These cute little critters are perfect for giving your young child extra help in their cutting, tracing and counting skills. They are super cute and fun to do together or independently! Your child will have fun drawing lines to match up their favorite animals or find their favorite flower. Tracing shapes and numbers is a great start for preparing your child for Kindergarten and this cute Spring Pre-K Theme printable is sure to keep them interested! This printable is perfect for your Pre-K classroom and goes right along with any Spring Pre-K Theme! It helps with the following skills…. You can print in color or black and white. Just change the setting on your printer to save yourself a little cash!! I find that it works great to use a Basic Laminator and Laminating Sheets so that your little one can use it over and over again! I hope your child enjoys the Spring Pre-K Theme Free Printable Download! Looking for more Spring Pre-K Theme Resources?? Here are some fantastic Spring Pre-K books that we have in our library!